Review of unprinted green cards below. The full spoiler is still located here. I also reviewed white, blue, black and red in previous articles. This thing replaces mold adder. Decent out of a limited sideboard to counterspell a doom blade. Great out of a constructed sideboard to hose blue. An improved tranquility. Sure why not. A plague zombies with a mediocre ability. OK filler for limited play. Underpowered in constructed. Kadama's Reach was a tournament staple. This sorcery isn't arcane but other than that it's an identical card. Should see plenty of use in both environments. The only reason this isn't a top pick is because it doesn't win the game by itself. But if you have any bombs in your deck this essentially becomes a copy. Feel free to splash this thing in limited. In constructed it will probably find a home somewhere. Major bomb that will win games quickly. In constructed I'm sure it will see some use despite the high casting cost. 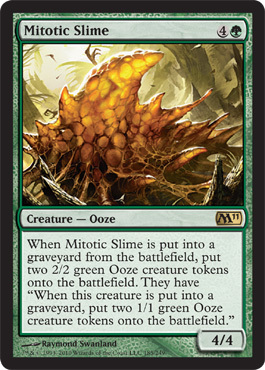 This is a solid 2 drop but the double green makes it less than exceptional in limited. It's still a solid pick but I wouldn't bother with it early. The trample is only exciting if you have something to buff it with. In constructed this will probably get recruited into mono green somehow. A solid bomb, take it early and then take as many creatures as you can that will trigger it's ability. Win game. A quality 5 drop that can stare down cards significantly more powerful. A great addition to any limited green card pool. Might have sideboard ramifications in limited since green has otherwise of removing problem utility creatures. Maybe a fun multiplayer card. Stay far away from this in draft. 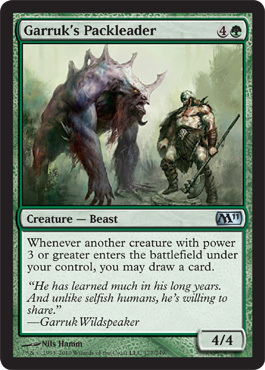 This could be a game breaker in limited if you have the right creatures, especially red or green. For constructed it might be a nice utility card out of the board. I'm not as impressed wtih this leyline as the other's however. A large creature at a reasonable cost that continues to annoy opponents well after they have removed it. First pick. 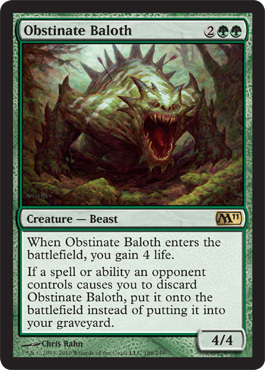 A solid beast for 4 mana. Even better out of the sideboard against discard hate. This card isn't as good as overrun but it's close and in some instances it can be better. For the limited player it's just as much of a bomb, just make sure you marry it to some decent creatures. Decent green hate. Will see more use in limited than constructed. It's essentially a +1/+1 counter that is delayed. In limited it could get out of hand for an opponent that doesn't respect it. Too slow for constructed. A good titan just like the rest of them. I think it's ability isn't as good as the other colors though. 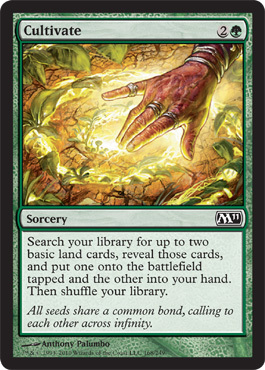 Land fetch is great early but do you really need more land once this thing gets into play? Pincer beetles was a decent guard back in the day and this thing is an improvement since it's controller can target it. It's a lot better with buff effects though. Not as good as it's cousin the borderland ranger but I can't argue with early mana fix and card advantage. This is also an elf. Not really a fan of walls without power. That said if you have zero ways of dealing with fliers this might be of use to your limited green deck. 1 Response to "Magic the Gathering: M11 Review - Green"
What?? 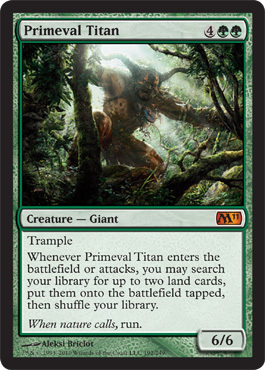 Primeval Titan does not get full marks? Warhammer Fantasy Battles: We issue errata too.